Taikoubou: I just saw a man with wings flying over there! You don't believe me? Ok,what if I'm right?Sibuxiang: I'll chew on a moon cake with my eye. If he doesn't exist, you get to chew on it.Taikoubou: You're on! Project Soul Hunt continues in Soul Hunter #2, the story of sinister demonsmanipulating the Yin Dynasty of China for it's own goals. One of the major events in the last volume was the discovery of Raishinshi, the baby who was named as the 100th son of the lord of the realm. Although it was something of a side-plot in the first volume, it comes back in a big way here. As we learned, Raishinshi was given to the immortals to be their newest disciple. Now, as Volume #2 begins, a mysterious being comes to Earth with the goal of wiping out evil. He is the immortal version of Raishinshi, now a powerful warrior given special, mechanical wings that allow him to fly and summon the power of lightning and wind.Unfortunately, Raishinshi's enthusiasm makes him awfully ignorant. So, when he runs into Taikoubou, who's been charged with cleaning up the planet of demons, he immediately assumes he's somehow evil because of his behavior. Two of the four episodes on the disc are mainly about this confrontation. Raishinshi insists on fighting Taikoubou, but Taikoubou wants a fair fight, without Paopei (the magical weapons given to them by the immortals). So, Taikoubou reveals his true hidden skill: the ability to get really drunk! When he does, he can use his drunken fist fighting technique, and with it he can defeat even immortals. Meanwhile, the Yin Dynasty is even grave condition. Dakki, the thousand year old demon, continues to seduce Emperor Zhou to the point where he obeys every one of her wishes. Zhou's generals Bunchu and Hiko can no longer stand his ineptitude and attempt to kill him.In reaction, Zhou arrests virtually everyone close to him, including his own wife, turning Yin into a police state. Taikoubou has spent too much time fooling around, and he'll soon pay for it when Dakki learns that he, Raishinshi, and other immortals have allied against her. In the meantime, General Bunchu tries to put together a complex plan to defeat Dakki on his own terms, using his own special powers. This dual story aspect makes Soul Hunter a little confusing, especially with all the characters involved, but with patience, it gets more rewarding. While the level of humor is still quite high, the serious moments are perfectly balanced, which is very interesting. One second, there's slapstick humor from Taikoubou's misadventures, the next there's some deep political drama going on. While this might lose some people, I actually enjoyed how it was placed together, especially since the immortal characters are surreal compared to the humans.I must admit, Soul Hunter is growing on me and I find it quite hilarious, but itisn't without some problems. The most obvious is the fact that despite Taikoubou and his assistant Sibuxiang (pronounced see-boo-chang) are supposed to be stopping demons and helping the Yin Empire, they're so incredibly inept that they seem many episodes away from making the smallest progress. This means the writing is stuck in a few ruts, primarily providing too much filler and not enough core plot. In addition to that, I don't think enough explanation is provided as to who each character is and what his/her motivations are. Most problematic is Bunchu, who seems to be quite powerful, but there's no explanation as to why he is so much like an immortal. In one scene, where he explains his plot against Dakki, he even summons computer-like displays providing data on his enemies. Where does this come from? He is from the future? It's confusing at times.Though I like the dual stories, I hope it begins to come together soon, because it's obvious that while the plot is told this way, it means very little gets done in one episode. In all four episodes, the time progression is minimal because so much information has to be given. That aside, though, there's plenty to enjoy in this active and exciting series. Despite its complexity, ADV at least provides enough supplemental material so that those who want to can learn more. Image Transfer Review: The episodes here have that strange, rather jarring combination of cel-animation and CG enhanced animation that appeared in the first volume. So, the quality tends to go all over the place from perfect, pristine animation in the CG portions, to slightly grainy in the traditional ones. This constant change is a little distracting, but the transfer handles it without any issues. There are no artifacts of any kind or any background movement. The graininess, while source-print based, never becomes more than a simple difference between animation styles. Audio Transfer Review: Both languages are effective Dolby 2.0 Surround mixes. While they don't get particularly active or wild, there is enough material in the front speakers to properly represent the on-screen action. Dialogue is perfectly clear and audible, and sound effects are always deep and impressive. Surround effects are almost nonexistent, but the few that do provide some additional ambience. Extras Review: Like the first volume, similar extras are provided to help viewers work out the complex character tree and terminology. Both the glossary and the relationship documents help make sense out of the large cast, and the translation notes are a superb way of allowing people to understand how Japanese terms are made more understandable to Westerners by a careful choice of verbiage. There are previews for other ADV discs (Plastic Little, Princess Nine, Gasaraki, Those Who Hunt Elves, Orphen), and an overall nice presentation with a wonderful color scheme. 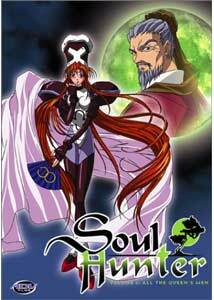 Although the case lists a trailer for Soul Hunter as an extra, I couldn't find it on the disc. The keepcase insert includes a quick document of definitions for some of the newer foreign terms featured in these latest episodes. Soul Hunter is an interesting twist on historical myth and legend. It's a slightly faulty, but mostly satisfying mixture of humor and serious emotional issues, which is difficult to get right. As a series, Soul Hunter has almost limitless future potential.